That's to the wonders of preview packs, I present you with some thoughts on this week's releases from BOOM! Studios .... before I even go to 2005 Will Eisner Spirit of Comics Retailer Award Winning Night Flight Comics! It's like magic! There are a few books in this here ScatterThoughts that are new to me, and Second Wave #5 is the one that really tests the maxim that "every issue is someone's first". I can't speak to how the issue works for someone who's following along, but if you're leaping in cold it's ... interesting. The situation is hinted at through some dialogue (aliens landed for the second time, and the U.S.A. has crumbled), but I really felt like I needed an introductory text piece, like what Marvel's been using lately. Especially for a smaller publisher with more limited distribution, it seems like a recipe for diminishing numbers. There's always a process of attrition in the readership wars, but without some attention paid to "every issue is someone's first" there's no way to replenish those ranks. This may be a great issue for those in the know: there's some fascinating character moments that give this staple genre scenario a great, human twist. I'm interested enough to keep reading, but the lack of background is a big hurdle to climb. Jeremiah Harm #4 leaves me in much the same situation of jumping in mid-story, but thanks in large part to the experience of Keith Giffen and Alan Grant, it's an easier landing. Though there's still no introductory text or set-up, it's a simpler scenario to get a hold of, a more manageable cast for characters, and the backstory is filled in well by dialogue. 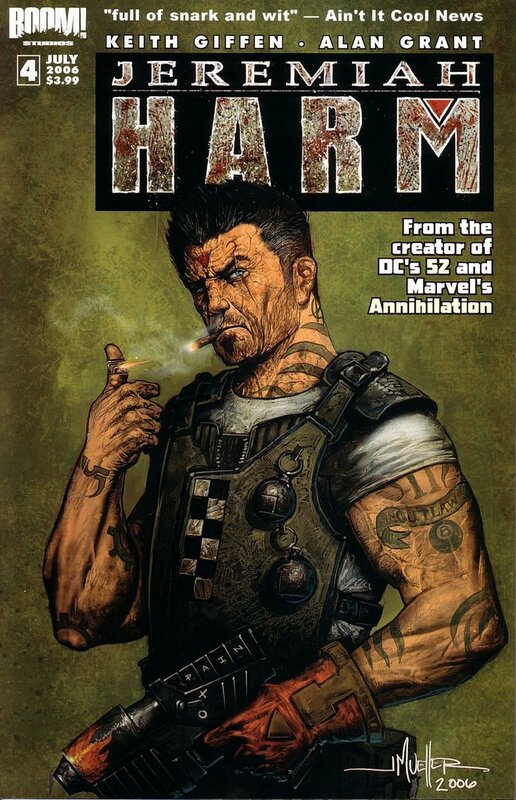 What really makes the book work, though, is that Jeremiah harm himself is such a likeable character: part Wolverine, part Lobo, part Fear Agent's Heath Huston. In fact, that Fear Agent comparison is very apt: though not so consciously emulating 50's pulp, Giffen and Grant hit all the notes of good pulpy adventure with honesty, directness, and not a hint of snark. Honestly, after hearing all the Lobo comparisons, I wasn't expecting to have this much fun with Jeremiah Harm. 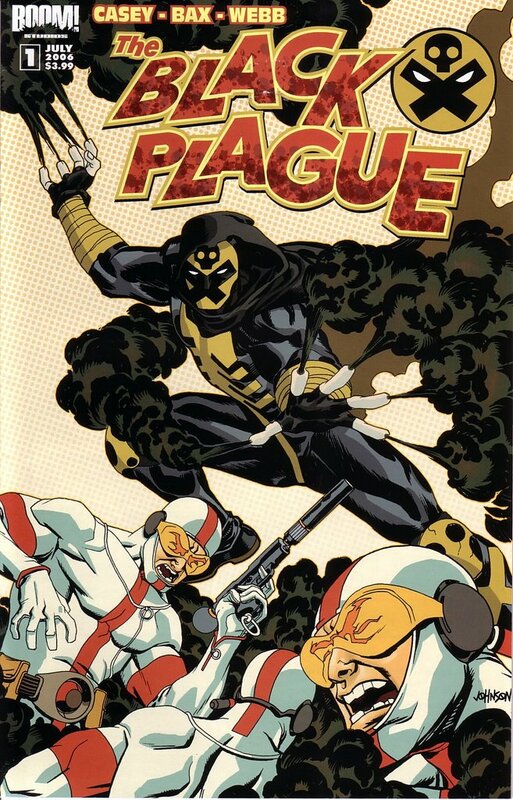 Finally we have a clean slate, a number one, that increasingly-mythical "jumping on point": The Black Plague #1. This new effort from GØDLAND's Joe Casey is an excellent first issue, setting up status quos and then smashing them with deftness and aplomb. 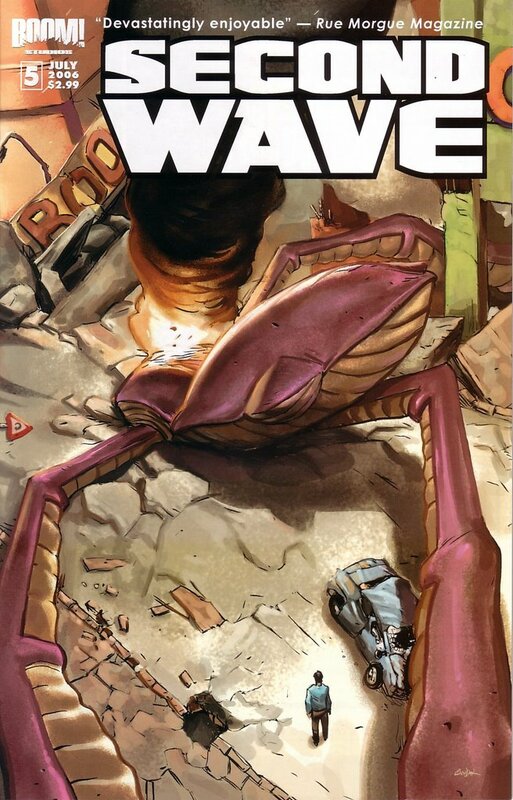 This is a bit like Wanted's smarter brother, with more twists and turns in the first issue than many current "big event miniseries" can manage in their entirety. Julia Bax's art is clean and cartoony, freeing keeping The Black Plague entirely in a fantasy world of superheroics, and it's all the better for it. In many ways, Casey is returning to the 70's Marvel that inspires GØDLAND, just a different section of it. Instead of Cosmic Kirby, what we have here is much more in tune with A.I.M. and S.H.I.E.L.D. and M.O.D.O.K. and all those other acronyms of goodness. This excellent one-shot sets the stage for an upcoming miniseries, and I'm looking forward to it. The Jeremiah Harm comparisons to Lobo are easy and mostly inaccurate I think. There's a general overall tone that's similar but Lobo was played for laughs when I think Harm has its funny moments but is a much more serious sci-fi story. Other than the change in artist this issue, I've really been impressed with this series. I found J. Harm #1 atrociously cliched and uninspiring but I'd like to hear more about this 2nd Wave series. Oh, and if they're providing you with review copies, kindly get a hold of "10" and tell me what you think. salt lake shakespeare 2006 season kicks off!